Support ASCII and Modbus RTU protocol. 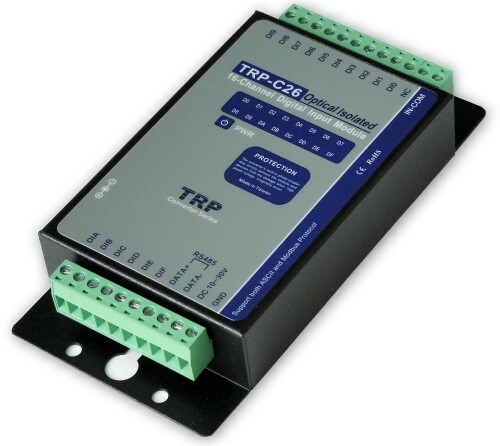 TRP-C26 provides 16 optical isolated digital input channels that allow you to input the logic signal from 0 to 30V DC. All channel features screw terminals for convenient connection of field signals as well as LED’s to indicate channel status. All inputs are equipped with photo-couplers to protect the module against high voltage spikes, as well as ground potential differences. For easy user access, TRP-C26 can enter configuration mode and self-test mode with outer dip-switch. TRP-C26 support both ASCII and Modbus protocol, with a full set of command, dual watch-dog, and auto reset function the module can be remote controlled by PC in ASCII or Modbus RTU protocol . Wide input range DC power supply.. Supports baud rates from 1.2Kbps to 115.2 Kbps. All 16 channels digital input ca be used as counter. Digital output signal with 3750Vrms isolation protection. Dual watchdog: Module’s firmware, host computer traffic. LED for each channels working status. DIN rail and panel mount support. Configured and self-test by outer dip-switch. 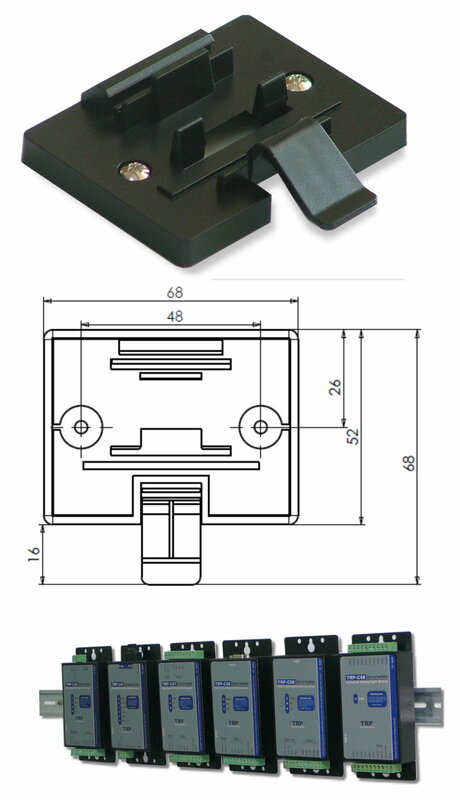 Support screw terminal and external DC power adaptor. Power Input Voltage: DC +10V to +30V. Protocol: ASCII and Modbus RTU. Input channel: 16 digital input channels with counter. Input digital input counter: 0~65535. Input logical level 0 +1V (max). Input logical level 1 +4.0V ~ +30V. Communication interface: RS-485.differential 2 half.duples wires. Communication speed: Baud rate from 1200bps to 115.2Kbps. Data format: Data bit: 8, Parity Check: None, Stop Bit: 1 . Inputs can be use as counter channel: 16. Dual watchdog Hardware reset circuit, module and host operating status. Operating environment: -10 to 50℃. Storage temperature: -20 to 70℃. Dimension: 151mm X 75mm X 26mm . © 2014 TRYCOM Technology Co.,Ltd.